Crataegus douglasii flowers have 10 stamens. Names: Mayflower is the name given to Hawthorns in the spring. 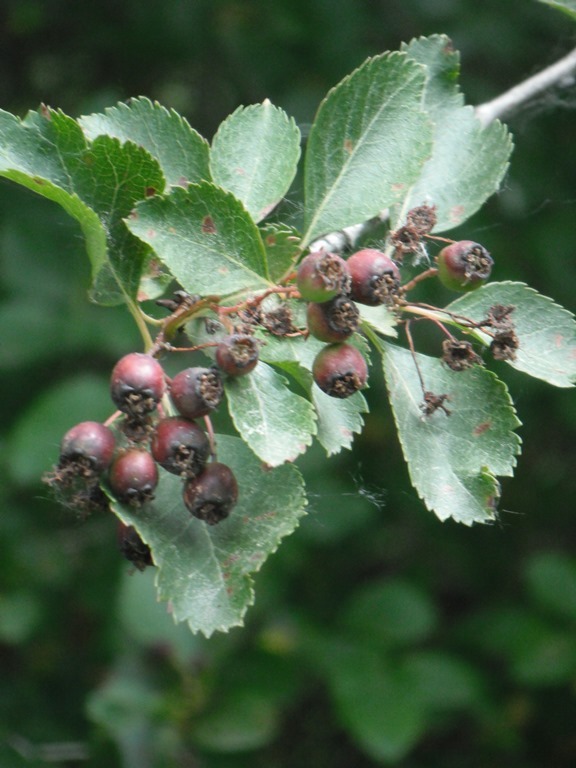 Douglas Hawthorn is also known as Black Hawthorn, Black Hawberry, Western Thornapple or similar variations thereof. Suksdorf’s Hawthorn was previously considered a variety of Douglas Hawthorn (C. douglasii var. suksdorfii). Both can be considered Black Hawthorns due to their black fruits. They are very similar and differ mostly in the number of chromosomes in each cell and the number of stamens within each flower. The tetraploid Douglas Hawthorn has 10 stamens. The diploid Suksdorf’s Hawthorn has 20 stamens. 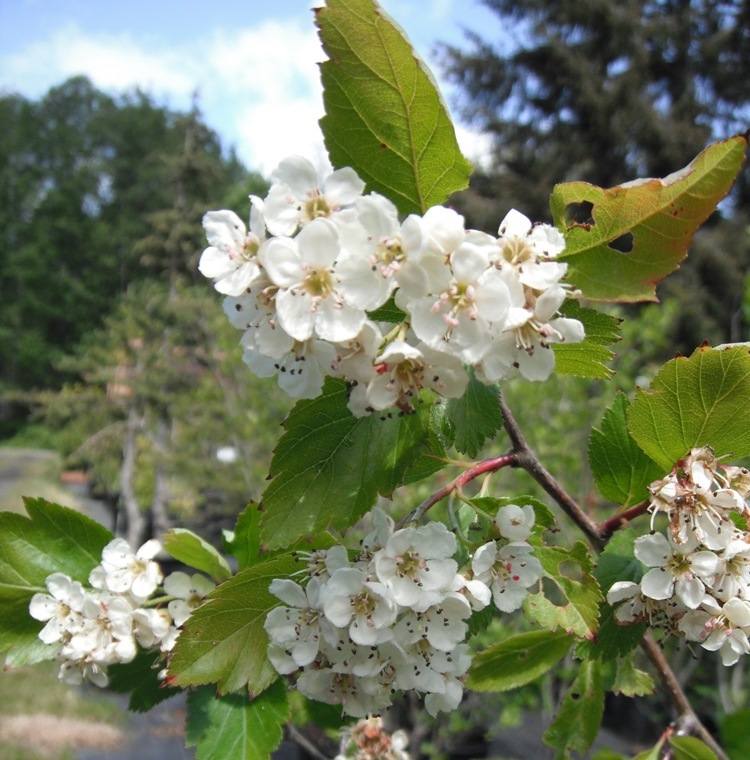 Because of the level of polyploidy in each of these species, Suksdorf’s Hawthorn is believed to be a parent of Douglas Hawthorn either through hybridization with another species or by doubling its own chromosome number. Relationships: There are hundreds of hawthorn species in North America, Europe and Asia. The exact number is difficult to determine because natural hybridization and polyploidy make it very challenging to classify species within this genus. Red Hawthorn, C. columbiana, which may be seen in some areas of the B.C. coast, is now either lumped in C. douglasii or C. chrysocarpa var. piperi. 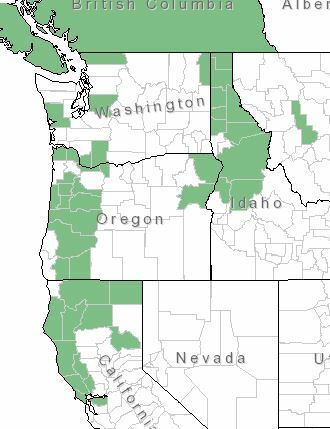 Oneseed Hawthorn, C. monogyna, is an introduced species, commonly found in the Pacific Northwest. 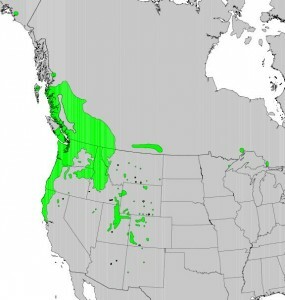 Distribution of Suksdorf Hawthorn from USDA–note it only occurs in the SW corner of BC. It is unclear if it still is present in SE Alaska. Distribution: Douglas Hawthorn is the most widespread member of its genus. It is found from southern Alaska to northern California in the west, and eastward across the northern United States and Canada in disjunctive populations to the Great Lakes region in the northeast. 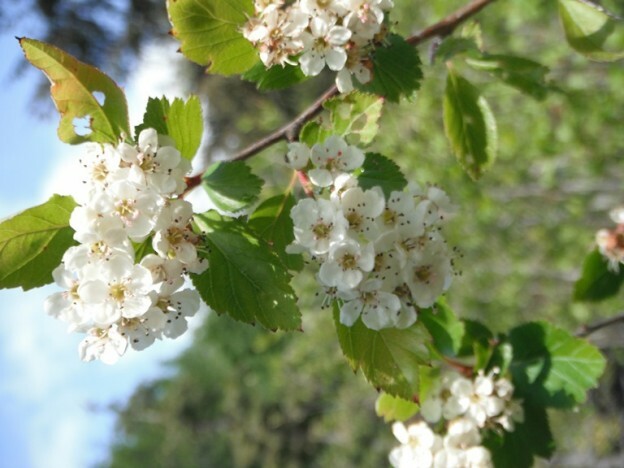 Suksdorf’s Hawthorn is found in all the Pacific Coast states including Idaho and Montana. 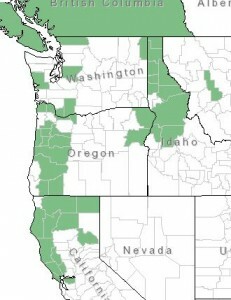 Both species have been observed growing together in eastern Oregon, eastern Washington, Idaho and the San Juan Islands. 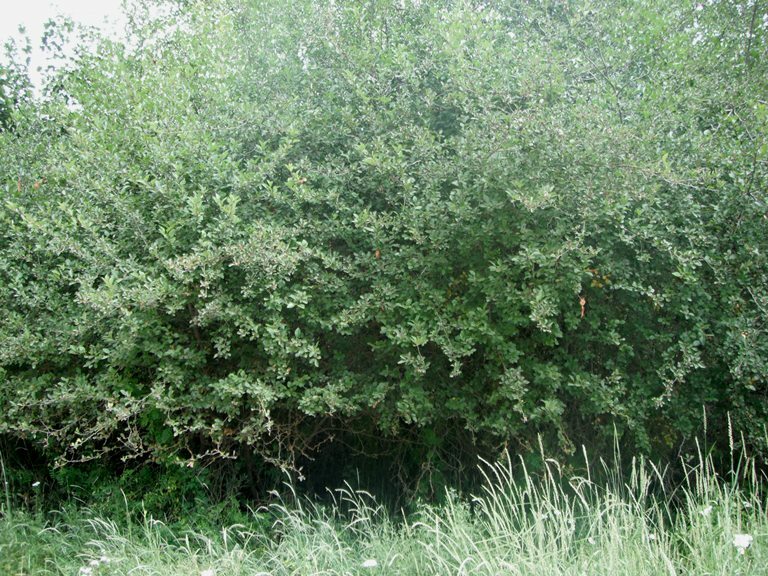 Growth: Black Hawthorns grow 20-45 feet (7-15m) tall. Habitat: Both grow in moist sites in open areas, forest edges and along streams. Douglas Hawthorn can tolerate drier sites. Wetland designation: FAC, Facultative, it is equally likely to occur wetlands or non-wetlands. Diagnostic Characters: Black Hawthorns have sharp thorns, about 3 cm long. Their leaves are thick and leathery with 5-9 lobes only at the top. White, stinky flowers are borne in clusters. Fruits are purplish black, apple-like, about 1 cm long. In the Landscape: Cultivated European species are grown for their attractive flowers and fruits. Black Hawthorns are good for restoration because their spreading roots hold soil and resist erosion. They also spread readily by root suckers. Planted as a hedge, Hawthorns can create an impenetrable, thorny thicket. Phenology: Bloom Period: May-June. Fruits are dispersed mid-July through August. Propagation: Black Hawthorn seed is best sown fresh outside in the fall. Some seeds may germinate in the spring, but most will take another year. Scarification in acid followed by a 3-month warm stratification at 60ºF (15ºC) and then a 3 month cold stratification at 40ºF (4ºC) may hasten germination. Black Hawthorn root suckers can also be transplanted. Use by People: The thorns from Black Hawthorn were used by natives for rake tines, lances and fishhooks. The hard wood was made into tool handles and weapons. The fruit was eaten both fresh and dried, but was not a favorite food. 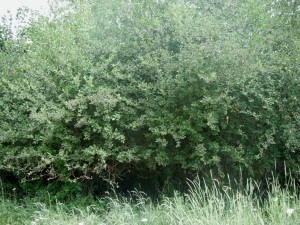 Black Hawthorns create an impenetrable hedge which is great for sheltering small birds and mammals. Use by Wildlife: The thickets created by Black Hawthorn are excellent habitat for wildlife, providing cover and nesting sites. The fruit is consumed by birds, such as Cedar Waxwings, and many types of mammals, but just as for native people, it is not a favorite food for most species of wildlife. 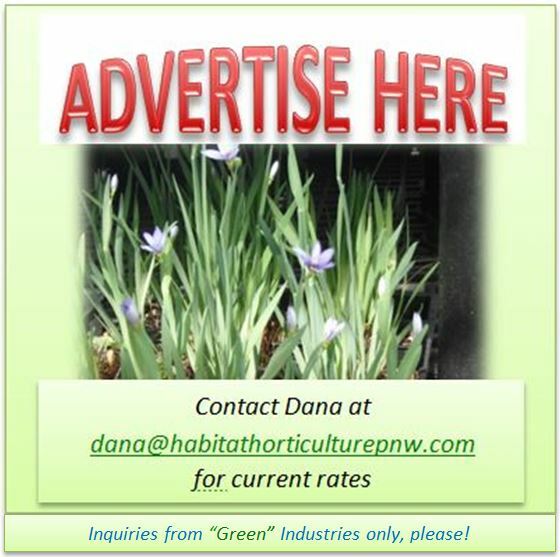 This entry was posted in Broadleaved Trees on March 23, 2015 by habitatdana.